This article describes how to create an EOS account. Wallets which did not contain EOS ERC20 (old EOS) tokens on or before June 2nd, 2018 will need to create a new EOS account name connected with their EOS private key. This can be done simply and safely inside Exodus without exposing your private keys and risking your funds. 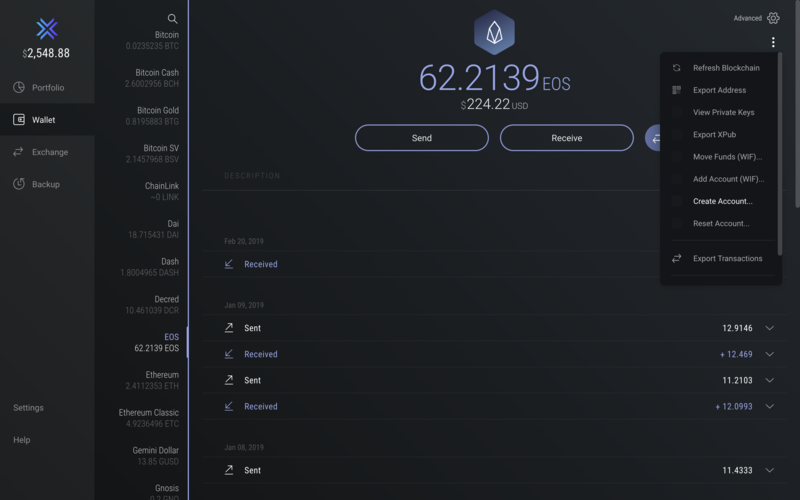 Note: While EOS Mainnet dedicated wallets allow creating multiple EOS account names and delegating resources to them from the primary account, your Exodus wallet only supports one EOS account name. The quickest and easiest way to create an EOS Account name is to exchange from any asset to EOS through the built-in Exchange feature. When doing this for the first time, part of the exchanged EOS (5 EOS) will be used to maintain your EOS account resources CPU, NET and RAM. The funds used during the account creation are not collected by Exodus, rather they are used for your resource staking. Head to the Exchange tab in your wallet, and set the right side of the exchange to EOS. On the left side of the screen, select which asset you'd like to exchange from. Enter the amount you wish to exchange. You can automatically populate an amount to be exchanged by clicking ALL, HALF, or MIN. You can also specify the exact amount you wish to exchange or receive by entering the values yourself. Click the Exchange button and presto! Once the exchange is complete, your EOS account in Exodus will be ready to rock. Some blockchain networks are quicker than others, and will impact the time before you see your EOS in Exodus. The typical duration of exchanges could be anywhere from 1 to 25 min. Hint: To quickly create your EOS account, exchange from Litecoin, Digibyte, any Ethereum asset, or XRP during this process. When you create your EOS account name using the exchange feature, wait for your exchange to complete. Once your EOS arrives in Exodus, you can successfully deposit and exchange more EOS using your newly created account. Once your exchange completes, you will be able to see the balance in your EOS wallet and use the Advanced Drawer to view your account name, staked and liquid balance as well as your EOS account resource allocation. 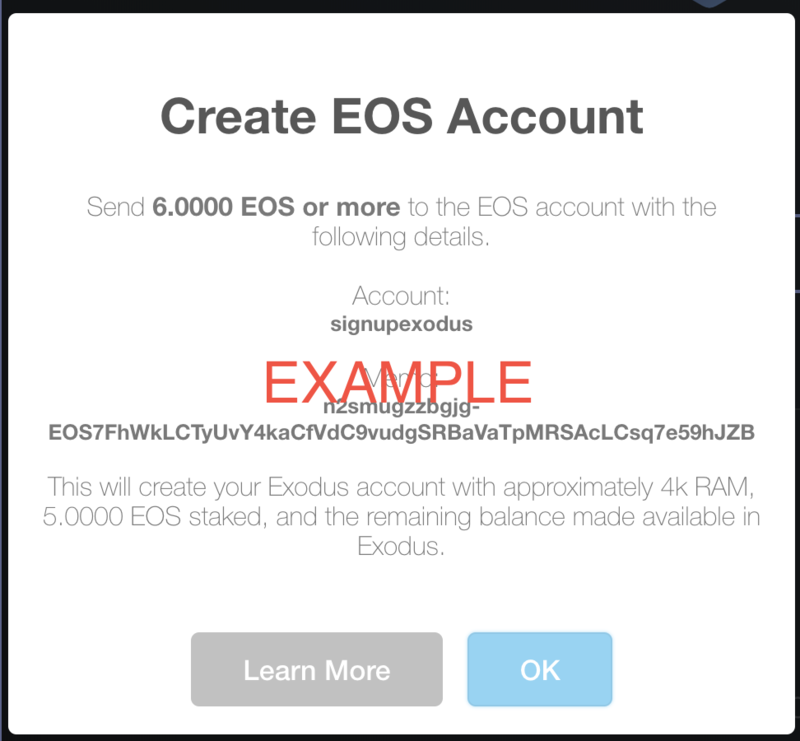 The second method of creating an EOS account name in Exodus requires you to already have EOS in another platform, and is accessed from the Asset Menu. This method can be used to send EOS to Exodus directly from an exchange if you don't have an account in Exodus. Navigate to the EOS section of your wallet. If you don't see EOS in your wallet, you can enable it in Settings. Open the Asset Menu by clicking on the three dots in the upper right corner of your wallet, and choose the Create Account option. Select and copy the account name signupexodus and the memo from the pop-up. From your existing EOS mainnet wallet, send 3 or more EOS to `signupexodus` and paste the copied information into the memo field. 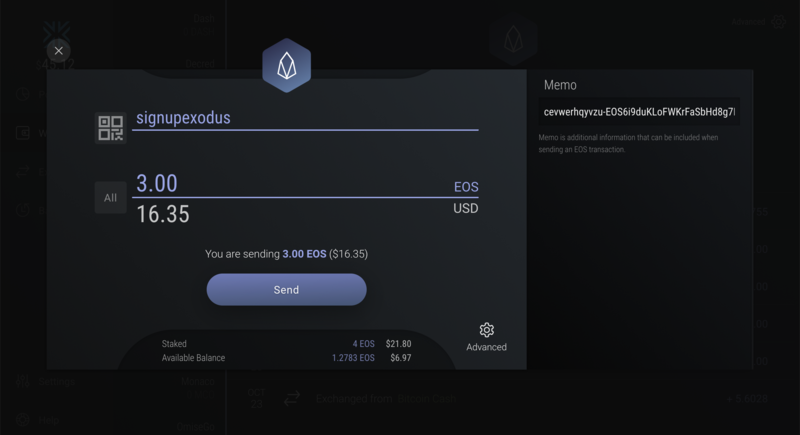 Return to your newly created Exodus EOS wallet and you should see the incoming transaction from the account creation and account details in the Advanced Drawer.